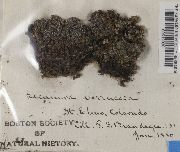 Thallus crustose, olive-green to whitish green, partly slightly pruinose, continuous to areolate to strongly verrucose-warty, lacking soredia or isidia; hypothallus indistinct. 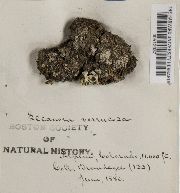 Apothecia immersed in areolae, appearing like Pertusaria; disk black, concave deeply, at first ostiolate, becoming broader, with a thin darkening border around ostiole within thalloid margin; hypothecium pale yellowish or brownish; epithecium K—, HC1—, HN03—; hymenium hyaline, inspersed at times, 1+ blue; paraphysoids slender, 1.5 µm, branched but not anastomosing, lax, tips only slightly thickened, not much darkened; asci clavate; spores 8, biseriate, thin-walled, wall single, ellipsoid, often containing oil drops, walls K—, 30-65 X 16-36 µm. Reactions: K—, C—, KC—, P—. 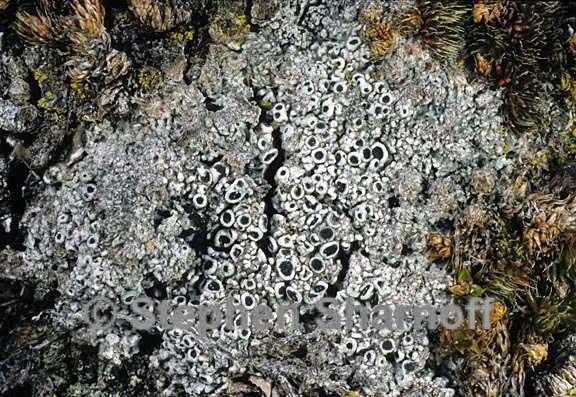 This species grows on moss, humus, and soil in the Arctic but also on tree trunks toward the southern edge of the range. It is circumpolar arctic-alpine; and boreal, and also occurs in the Andes in South America. In North America it ranges south to North Carolina, Minnesota, New Mexico, and California. 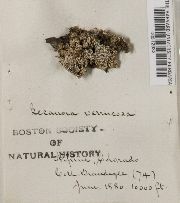 Substrate and ecology: var. 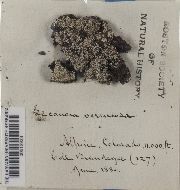 verrucosa on humus and litter, or soil or bryophytes; especially on calcareous substrates, including limestone, but also over volcanic and other siliceous rocks; mostly subalpine to alpine, World distribution: Europe, Macaronesia, Asia, South America, and North America Sonoran distribution: not currently known but in adjacent Rocky Mountain states.